Elder David A. Bednar of the Quorum of the Twelve spent 13 days traveling in the Pacific Area during January. 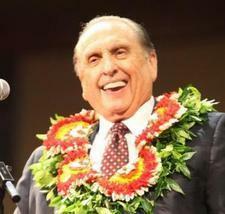 Stops on his itinerary included Tonga, New Zealand, Hawaii and the Marshall Islands. "According to information provided by the mission president, it was the first time a member of the Quorum of the Twelve had been to and walked on Marjuro," said Elder Bednar. 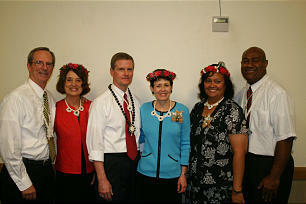 "The people of the Marshall Islands were very warm and welcoming." Accompanying Elder Bednar during his travels was his wife, Sister Susan Bednar; also joining him for part or all of his travels were Elder Claudio R.M. Costa of the Presidency of the Seventy, Bishop Richard C. Edgley of the Presiding Bishopric, Elder Tad R. Callister of the Seventy and President of the Pacific Area, and Elder James J. Hamula of the Seventy and first counselor in the Pacific Area Presidency. "As we travel to the isles of the sea and the uttermost parts of the earth, we see the Church is everywhere," Elder Bednar said. "It is firmly established, it is growing, and there are faithful, good people. It is truly miraculous."